Brief Synopsis – After moving into a new house, a young couple feel threatened by their new neighbor, a veteran police office. My Take on it – This is a film that I was interested in seeing for quite some time especially since I was very curious as to how Samuel L. Jackson would present his role in this movie. This is a movie that actually starts off very well and seems to be moving in a nice direction and then they switch things around and take it into strange territory which derails everything it established beforehand. Jackson does a wonderful job in the role that they give him because he is able to play his character in numerous ways which helps the viewer constantly question and analyze all of his decisions since we would like to understand his motivation. The premise presented to us isn’t original and there are there films that have done this kind of thing much better – most notably Unlawful Entry (1992) and this rendition of that ind of story feels too mediocre for it’s own good. Bottom Line – Film that starts off really well and then moves into very strange territory that takes away from everything done beforehand. 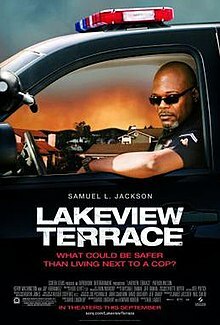 Jackson is perfectly cast in the role of the cop in this film and is able to play the character in numerous ways that makes the viewer question much of his motivations throughout the film. This kind of premise has been done much better and this seems too mediocre for its own good. They seem to allude to racial issues and other events related to the past, yet keep things a bit too ambiguous and that hurts this film.